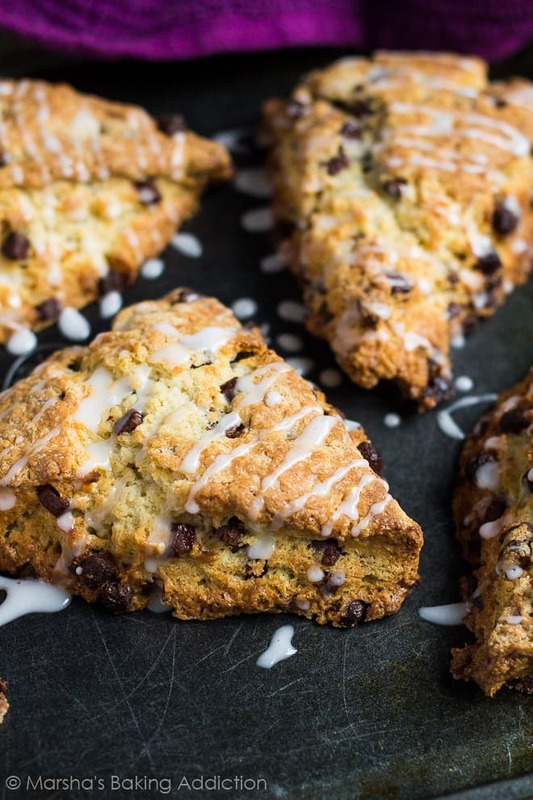 Chocolate Chip Scones – Deliciously moist, fluffy and tender vanilla scones stuffed full of chocolate chips, and drizzled with a sweet glaze! 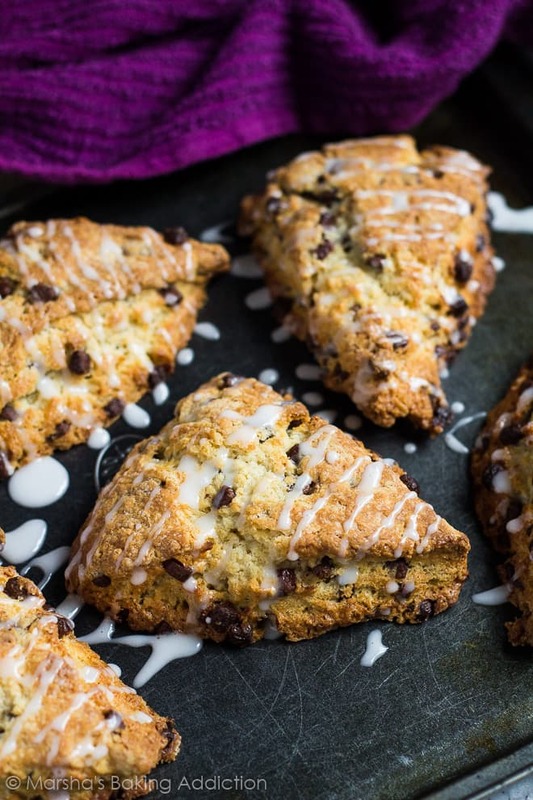 Are you a fan of scones for breakfast, or snack? 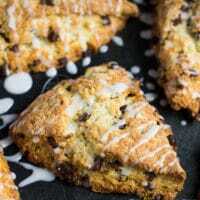 I absolutely love these Chocolate Chip Scones paired with my cup of tea in the mornings, and today I bring you the recipe! These scones are incredibly moist, soft, and fluffy on the inside, and deliciously crispy on the outside. 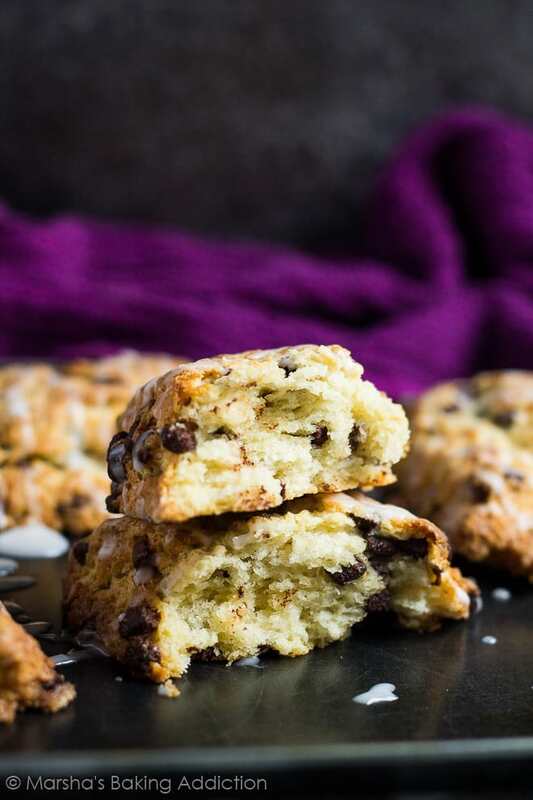 Stuff them with chocolate chips and you have yourself the perfect warm, indulgent scone for breakfast. Of course, you don’t have to use chocolate chips – you can use another sweet treat, or even your favourite berries! For the glaze, I simply whisked together some icing sugar and milk to create a sweet drizzle for my scones. 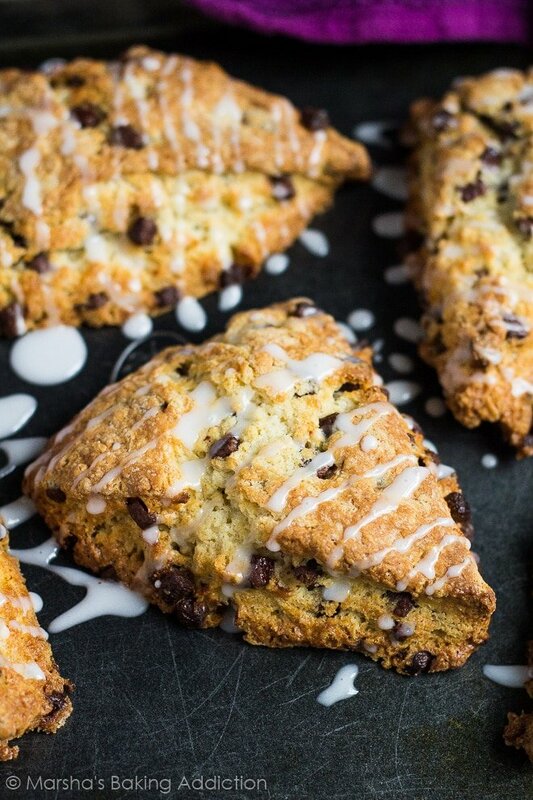 Deliciously moist, fluffy and tender vanilla scones stuffed full of chocolate chips, and drizzled with a sweet glaze! Preheat the oven to 200C/400F/Gas 6. Line a baking tray with parchment paper or a silicone mat, and set aside. In a large bowl, whisk together the flour, sugar, baking powder, and salt. Add the butter and, using a pastry cutter, fork, or your fingertips, work it into the mixture until it resembles coarse crumbs. You may also use a food processor. Fold in the chocolate chips. In a separate bowl, whisk together the egg, cream, and vanilla until combined. Pour into the flour mixture and gently fold in until a soft dough is formed. Do not overmix. Turn the dough out onto a lightly floured surface, and shape into an 8-inch round disc. Cut into 8 wedges, and transfer them to the prepared baking tray. Lightly brush each scone with heavy cream, then bake for 20 - 25 minutes or until lightly golden and cooked through. Allow to cool on the baking tray for 5 - 10 minutes before transferring them to a wire rack to cool slightly whilst preparing the glaze. Whisk together the icing sugar and milk until smooth and runny. Drizzle over warm or room temperature scones and enjoy! Scones are best warm on the day they are made, but leftovers can be kept in an airtight container at room temperature or in the fridge for up to 2 days. They also freeze well for up to 3 months. Thaw overnight in the fridge before serving. I know it sounds silly but I love that scones are triangular in the US 😛 that always blows my mind! I can’t say I’ve ever had chocolate scones either. Will have to give these a try! I know, right? More fascinating than our British ones LOL American scones tend to be more sweet than savoury, too! Sounds like a yummy alternative to traditional fruit or cheese scones (here in The UK). Would never have thought to add chocolate chips. A delicious sweet breakfast, a great start to the day. Look at these scones! I want to take bite right now!!! 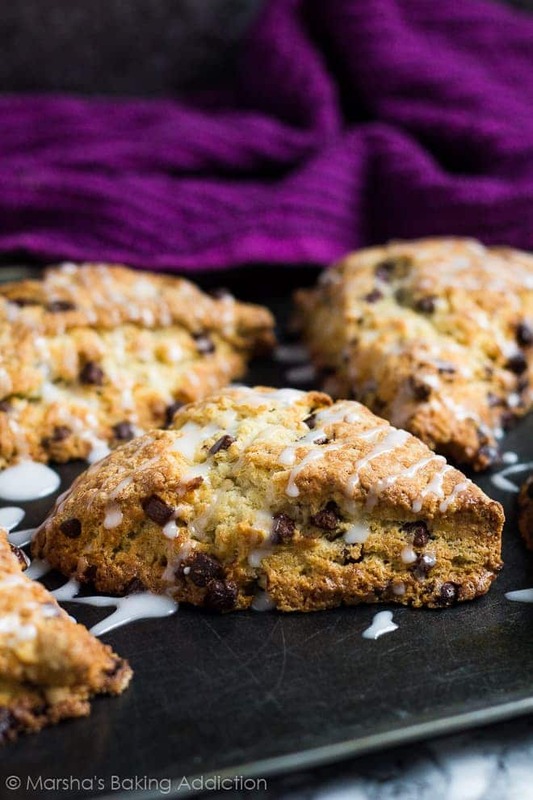 I’d never thought of chocolate chip scones before, but these look yummy. Shame I’ve given up chocolate for lent!